In fall 2016, University of Minnesota Extension, along with the Smarter Lunchrooms National Office and key organizations in the state, formed the Minnesota Smarter Lunchrooms Collaborative. The collaborative’s goal is to improve the school nutrition environment by making the healthy choice the easy choice. I, and other North Dakota State University (NDSU) Extension health and nutrition specialists, saw the impressive work that University of Minnesota SNAP-Ed educators and other certified technical assistance providers (TAPs) were achieving through Smarter Lunchrooms. So, in spring 2017, we held the first North Dakota Extension TAP advisor training session. A total of 35 NDSU Extension educators received TAPs training at this session and were tasked to begin work with their local school nutrition programs. For several months, North Dakota TAP advisors met to discuss Smarter Lunchroom challenges and successes. However, these meet-ups were far too quiet. Many TAP advisors found themselves struggling, wanting more insight on how to begin Smarter Lunchrooms work. There was a need to hear and learn from those who had already began executing Smarter Lunchrooms tactics. 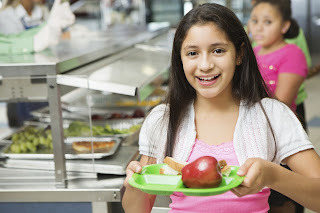 After learning that North Dakota was seeking additional TAP input, the Minnesota Smarter Lunchrooms Collaborative proposed that the two states join forces. As a result, collaborative meetings have included both Minnesota and North Dakota TAP advisors since January 2018. Meetings have provided a platform for peer-to-peer learning that has been invaluable to North Dakota TAP advisors. TAP advisors from both states are able to share successes and challenges, and brainstorm problem-solving strategies for difficult situations. This dual-state collaboration has created a space for support and inspiration, and it’s our hope to see it continue to flourish as our Smarter Lunchroom work progresses.